European officials and governments are much more anxious about the Greek drama than they are admitting publicly. They fear a miscalculation in the weeks ahead could precipitate a full-blown crisis. The past week has witnessed the opening tense and abrasive rounds. Nerves have been left frayed. 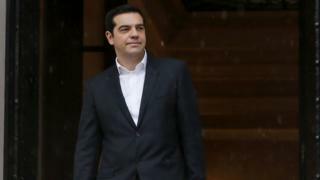 The new radical-left Greek government said it would no longer negotiate with the troika: officials from the International Monetary Fund (IMF), the European Union (EU) and the European Central Bank (ECB). That did not go down well with European officials. Greece's government also said it would refuse new loans from the EU and the IMF. That raised the question of how it would finance itself. Ministers also began working on plans to raise the minimum wage and that led to concerns that Athens was no longer sticking to the terms of its bailout agreement. Then it was announced that the new government had hired the financial advisory firm Lazard to negotiate a big cut in Greece's debt. It led the German chancellor Angela Merkel to issue a terse statement: "I do not envisage fresh debt cancellation". By the end of the first week, the new Greek prime minister, Alexis Tsipras, decided he needed to offer some reassurances. "No side," he said, "is seeking conflict, and it has never been our intention to act unilaterally on Greek debt." Greece, he said, would not renege on its debt. None of that disguises the fundamental rift. A majority of voters in a eurozone country have rejected the terms of a bailout agreement authored in Brussels and Berlin. What is at stake here is not just the fate of Greece and whether it stays in the eurozone, but the authority of Germany to define the narrative in Europe and in the eurozone. This week the real negotiations begin. Both Mr Tsipras and his finance minister, Yanis Varoufakis, start trips looking for allies. Mr Tsipras will visit Rome on Tuesday and Paris on Wednesday. Initially there were no plans to visit Berlin although Mr Varoufakis now says he wants to go there. There is urgency to these talks. Greece's bailout agreement expires on 28 February. If it is not extended, the European Central Bank would have to stop lending Greece money. Also, Athens would not get 7.2 billion euros, the next tranche of bailout money, without a review of its reform programme being completed. The new government has boldly said it would not accept new IMF-EU loans, prompting questions over how long its finances would last without a deal. So what is Alexis Tsipras's strategy and can it work? Firstly, his government wants to negotiate directly with European governments and not through EU officials. They are making their initial pitch to Paris and Rome, because they believe those governments are more sympathetic to Mr Tsipras's argument that austerity has been a disaster for Europe. Berlin will be wary of any hints at concessions that undermine the existing bailout agreements. Mr Tsipras will argue that Greece's debt levels at 175% of GDP are unsustainable. Although some European officials pretended otherwise, most of Europe's leaders knew that to be true. However, Athens will face significant resistance to any write-down of Greek debt. Angela Merkel has made it clear: "There has already been voluntary debt forgiveness by private creditors, banks have already slashed billions from Greece's debts". The German voters also seem determined to resist any further concessions. 76% oppose any reduction in Greek debt. The Finns, the Dutch, the Spanish - to name just a few countries -are not open to writing off any Greek debt. The best that Athens could expect would be for its existing bailout agreement to be extended. There might also be a willingness to push back the maturity of some of its debt and perhaps to tie debt repayments more closely to growth. All of that would lower the cost to Greece, but Germany would only consider these steps if the new government sticks to the reforms agreed under the existing bailout programme. And that goes to the heart of why this will be such a complex negotiation. Syriza came to power in Greece by saying that the bailout conditions had broken the Greek economy and caused a humanitarian crisis. Already the new finance minister has stopped the privatisation of two ports and is moving to increase the minimum wage and rehire some public sector workers. If all the new government's plans are implemented, they would amount to a 13.5 billion euro stimulus programme and that would clearly breach the existing bailout agreement. The head of the group which manages the eurozone, Jeroen Dijsselbloem, has warned "taking unilateral steps or ignoring previous arrangements is not the way forward". Alexis Tsipras believes the existing deal is a disaster and says he has a democratic mandate to demand changes. And this exposes democracy's limits within the European Union. The German finance minister Wolfgang Schaeuble says: "Elections change nothing. There are rules". The president of the European Commission Jean-Claude Juncker said "there can be no democratic choice against the European treaties. One cannot exit the euro without leaving the EU". But Greek voters and their hardship cannot simply be ignored. It risks only strengthening the anti-establishment parties elsewhere in Europe, many of which are sceptical of the whole European project. So there is a clear incentive to reach a deal. It might just be possible to extend the maturity of Greek debt and to link the servicing of the debt to growth and to soften some of the existing bailout terms in exchange for a commitment to further structural reforms. But here's the problem: Alexis Tsipras will have to sell any agreement to his voters. On the campaign trail, he promised that his first day in office would mark the beginning of the end of austerity. He promised too that the country's debts would be reduced. At the very least he will have to demonstrate he has eased austerity. Angela Merkel and other leaders will not just be mindful of voters unwilling to make any further concessions to the Greeks. They will be fearful that if they help Athens, other eurozone countries will come looking for help with their debt or their austerity programmes. Spain, in particular, will play hardball. It faces an electoral challenge from Podemos, a similar party to Syriza. On Saturday, its leader Pablo Iglesias said "the wind of change is starting to blow in Europe". The Spanish prime minister, Mariano Rajoy, will not accept anything which strengthens the radical left in Spain. And Europe's leaders will be wary of giving any encouragement to a so-called "Red Spring". European leaders will do everything they can to keep Greece in the eurozone. Whatever they might say publicly, they would be fearful that a Greek exit would be the start of unpredictable events that would shake the EU and undermine the eurozone. Officials will also want a deal, because the current crisis lays bare some of the fault lines in Europe today. There is an undeniable north/south divide in the eurozone. There is a growing revolt against the German remedy for the crisis. Without some compromise, there is the chance of that opposition testing the unity of the eurozone. It is why one senior EU official said these next few weeks will be as serious as anything that occurred in the dark days of 2011 and 2012.